Records are arranged in streets. In each street page you can find full lists of residents by house, by year and census reports of each house (every 10 years). Click on House Histories to find more information about each property. This archive is a work in progress and additional information is very welcome. Please use the ‘Contact us’ box if you have a contribution. More House Histories, articles, illustrations and ‘Remarkable Visitors’ will be added. Recently published: WILLIAM CONINGHAM AT 6.LEWES CRESCENT. BALLROOM PICTURES AT 31 SUSSEX SQUARE. A WELL AT 2 SUSSEX SQUARE. AN IMPORTANT DRAIN AT 36 SUSSEX SQUARE. The Estate Gardens have been in place since before most of the houses were built. 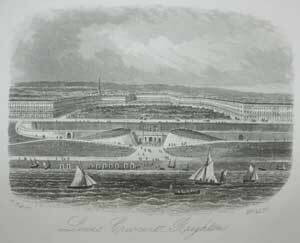 Work began on the formidable task of levelling and enclosing 2.4 hectares of ground in 1823. They were original in three sections - the North Garden and two others below what is now Eastern Road, with a road separating the semi-circular garden of Lewes Crescent. 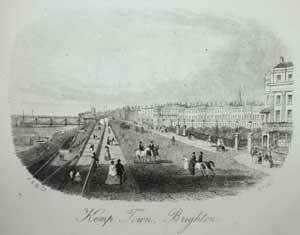 This was removed in 1828, the year that the tunnel to the Esplanade was added. Henry Phillips, a local botanist, was appointed to lay out the Gardens at a cost of £371 10s 8d. The Enclosures Committee which first met on 5th May 1828, still continues to manage the running of the Gardens. Early meetings were concerned almost entirely with the construction of the Esplanade and the tunnel, which went on until1840. Recurring items in subsequent meetings were the rate each household should pay to use the Gardens, the admission (or exclusion) of so-called ‘Outsiders’ to the Gardens (those who did not live on the Estate), children and dogs. The latter have been allowed since 1922. The Agenda at today’s AGMs would have been instantly recognisable to Kemp and his original Committee. 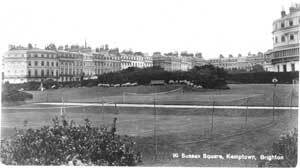 Lord Rendel of Hatchlands started buying up property and land, including the North and South Gardens, within Kemp Town from 1901 onwards with a view to turning the properties into flats. 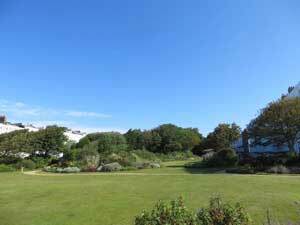 He bought 20 properties in Sussex Square.. A descendant of the Rendel family, Thomas Raymond Dunne, passed the Gardens to the Kemp Town Freeholders 8 November 1995..
One of the earliest records describes the purchase in 1833 of a mowing machine. Originally pushed by hand (presumably) by John Cocksedge and Charles Shirley, it was adapted in 1847 to be driven by a donkey. A donkey was thus purchased each Spring and sold again the following Autumn. A local myth has it that a donkey, having died on duty, was buried over the tunnel. 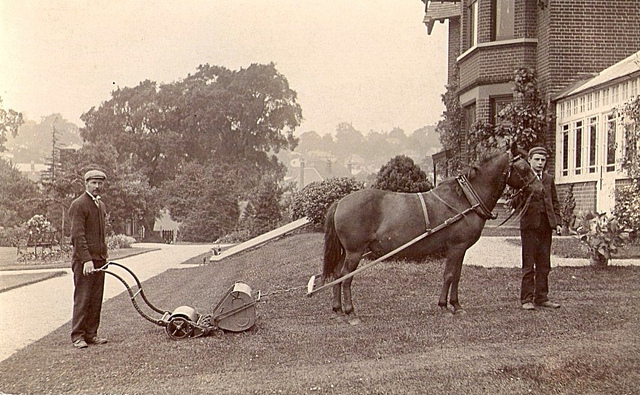 A motor mower was bought in 1923. In the 1880s, as Lawn Tennis was becoming fashionable, there was a call for a court in the Gardens, to which the Committee eventually agreed. By 1886, four courts were available. In 1907, a Croquet Lawn was added. These continued to be in use until 1939, when the outbreak of war literally changed the landscape. Water towers were constructed in the North and South Gardens; barbed wire surrounded these, limiting the residents to roughly one quarter of the space they had previously enjoyed; concrete shelters were built in front of Arundel Terrace and at the top of Duke’s Mound; and other spaces, such as the Reading Room, were used for military storage. The most lasting war damage inflicted was to the railings. These had been in place since 1823 and were sawn down in 1942 by the Ministry of Supply, ostensibly for munitions, only to be left piled up at Shoreham for the remainder of the war and latterly sold for scrap. Chestnut palings and flimsy wire netting followed as temporary measures, then posts and chains in 1947. Not until 1973 were the Committee able to take advantage of a government grant to replace the railings with what we see today. The 1100 yards of railings cost £24,000 with £6,000 for associated landscaping costs. Unfortunately there was only money for ungalvanised hard steel rather than cast iron and as a result the railings are again in need of replacement after 40 years. Work is in progress to replace the plinth and railings enclosing the southernmost part of the Gardens once more, and the Committee is still looking at ways of raising the remaining £100,000 needed to complete the job. 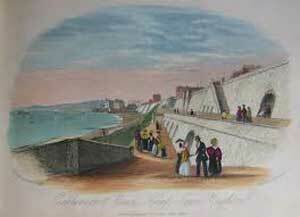 The Esplanade and Slopes to the beach were designed by Henry Edward Kendall Jun. The entrance to the tunnel on the southern side is flanked by two cottages, originally for the Head Gardener and the Constable, but now privately owned. On the Lower Esplanade, he added the Reading Room which was used for Committee meetings for many years, but is now open to the elements. 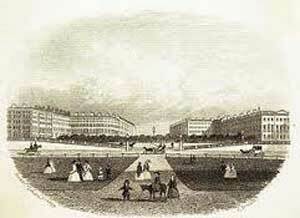 The slopes were enclosed by a fence in 1865, thereby initiating a long debate with the Corporation, which was not resolved until 1952 with their compulsory purchase for £750.00. It would have been impossible to make this archive without the dedicated help of Andrew Lansdown, Keith and Jayne Paulin, Simon Smith. Nickie Swaden-Ward and Zoe Woodward. Further thanks for their help and encouragement from Dr. Sue Berry with generous permission to use some of her work, Michael Osborne, Nick Tyson, Andrew Doig for sharing his extensive research, and many residents on the Estate past and present. Christina M.Gee M.B.E.for the initial use of her research, Ben Borrett for the use of his beautiful photographs and Adam Liversidge who built these pages and gave much good advice! 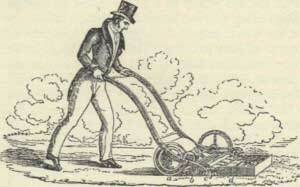 Contemporary hand operated lawn mower. Hand pushed lawn mower adapted to horse or donkey power.